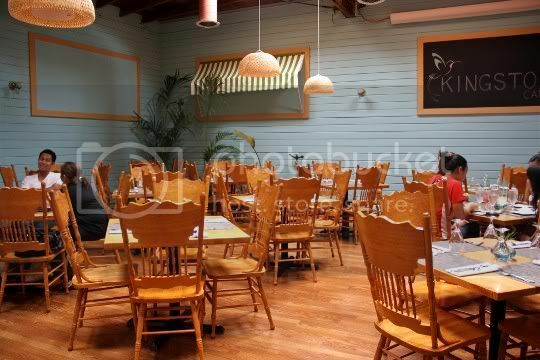 As seen on Gordon Ramsay's "Kitchen Nightmares"! From the outside, Kingston Cafe looks like an old homey dentist's office. 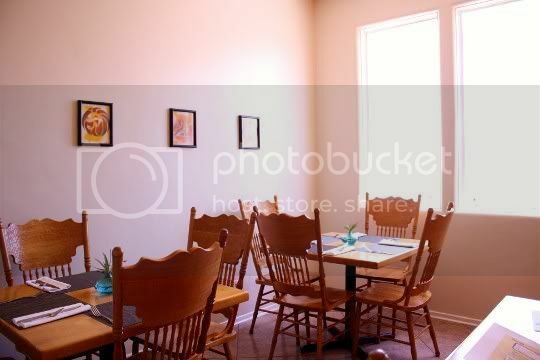 Located on the less-frequented and touristy side of Fair Oaks Avenue in Pasadena, it has that down-to-earth, neighborhood feel...as if only the locals know what a gem this truly is. They must know something, considering it's been up and running for almost 20 years! This may easily be one of the cutest hidden gems I've ever visited. It's like the old dentist's office was converted into an tropical aromatic oasis. From the simple entrance, you can see the adjacent dining rooms down the hallway with stunning amounts of sunlight streaming out of them. The rooms are sunny and warm (albeit, a little hot) with only about four tables in each one, giving you a super private and intimate dining experience. But that's not all (as I first thought). Walk down the hallway, past the kitchen, and into the surprisingly large, airy, Caribbean-style dining room (with a great bar). From here, head straight back to the huge outdoor patio with even more of that tropical island flair. Seriously, you feel like you're in the islands somewhere. And Saturday nights? Free live reggae! This would be a GREAT place for a wedding reception. 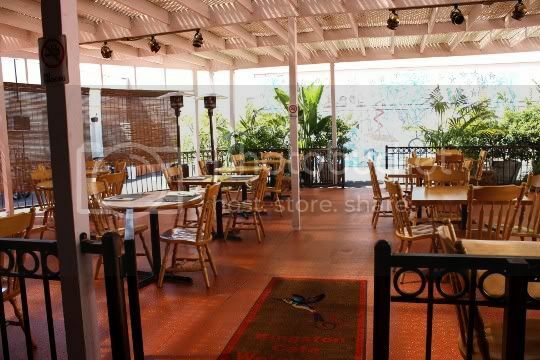 What makes Kingston Cafe's atmosphere even more inviting is the sociable and super friendly staff. They're attentive, warm, and always smiling...but not in that annoying corny way. They're very knowledgeable about the menu, and the service overall is really some of the best I've had in a while. And speaking of stellar service...it was at my waiter's suggestion that I try their sangria when I couldn't decide on what I wanted from the nicely stocked beer and wine list. I really was not even thinking about sangria, but he convinced me to try it. And I'm so glad he did. 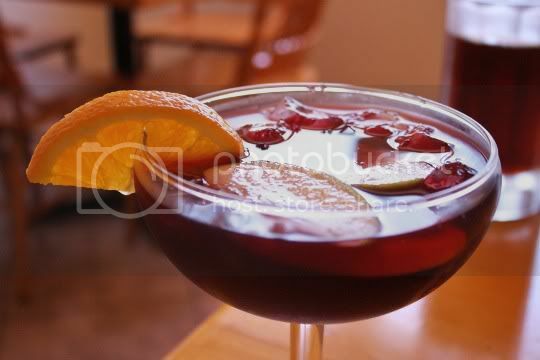 This is easily some of the best sangria I've had! It's sweet without being overly sweet, light and fruity, and cold and refreshing. It's filled with apple and orange slices that are simply divine to eat once your glass is empty. And empty it you will. But beware, it's possible to get a bit buzzed off of only one glass! Another welcome suggestion from our waiter is the house made jerk sauce. The island's answer to hot sauce, you'll want to put this on everything! It's spicy and tangy, with a heavy dose of warm and aromatic allspice. Not that the food (which shall be mentioned below) needs any additional seasoning, but this stuff just takes it to a whole 'nother level. I think they sell it by the bottle too! 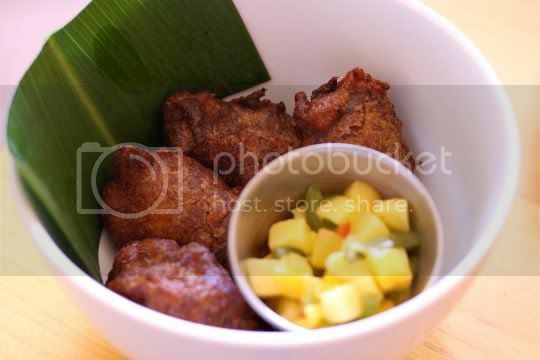 You can't go to a Caribbean restaurant and not have plantains, so why not start off with these delicious fritters? These dark brown nuggets of mashed plantain are fried to perfect crispness, yet they remain chewy on the inside. They also surprisingly aren't overly greasy. They're sweet with lots of cinnamon and nutmeg, almost making these dessert-like in flavor. Try them with the jerk sauce for a more savory dish, or top each bit with a bit of the mango-pineapple salsa: sweet and pungent, refreshing, and laced with bits of jalapeno and green onion for a little kick. 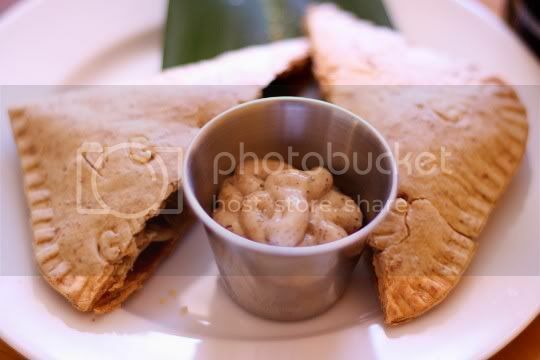 Another staple item to dine on in Jamaican cuisine is the patties...and these are exceptional! Although thinner than what I've had in the past, these are so full of flavor it's ridiculous. If you're really digging these, you could easily order two or three and eat them as a main dish, I know I would! The crust is crisp, flaky, and lightly salted (and how cute is the VG stamped on the dough!). But it's the filling that will knock your socks off. Cabbage, carrots, onions, and corn are mixed together in what tastes just like a delicious vegetable stew. It's salty, tangy, a little sweet, and oh-so-comforting. The patties are served alongside a super salty and garlicky cream sauce for dipping, which is equally addictive. Kingston Cafe's vegetarian entree is satisfying and hearty. 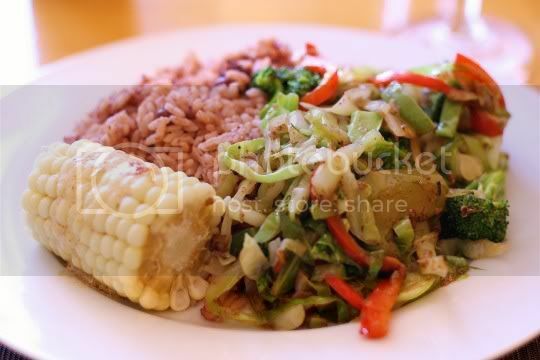 A mass of shredded veggies is served with red beans and rice, and corn on the cob. The veggies consist of cabbage, broccoli, and bell peppers, and are so perfectly seasoned and cooked. They aren't steamed/sauteed to death, so they're left with a nice texture and bite. They're tangy and salty, and you may find yourself eating more of the veggie than anything else on the plate. The "red beans and rice" are actually more of the traditional Jamaican rice and peas: red beans with rice cooked in coconut milk, which you can definitely taste. You get more rice than beans, but the rice is so tender and soft that you won't care. The corn on the cob is served piping hot, with a pat of tangy lime butter. With your entree comes a stick of festival bread and a couple of sauteed plantains. The festival bread are very similar to hush puppies, fried sticks of sweet cornmeal-based batter. These are slightly bland, but crunchy and nicely textured. They taste a little like corndog batter, but heavy with spices including cloves. 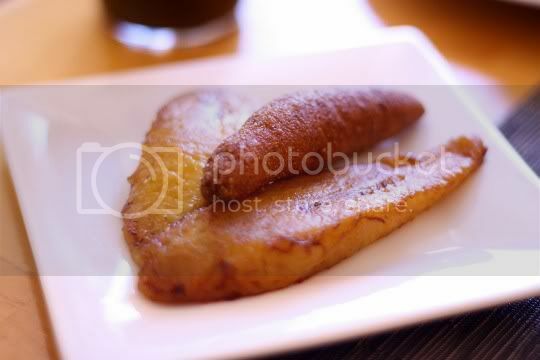 The plantains are slightly sweet and caramelized, with a nice tangy lime juice flavor. Believe it or not, this was my first time ever eating rum cake. I was always turned off by it, as I've been told that it's similar to the godforsaken holiday fruitcake. Now I'm not sure if this is how most rum cakes typically are, but this one seemed to be more of a rum bread pudding (but sliced in cake form). And guess what...it was good! 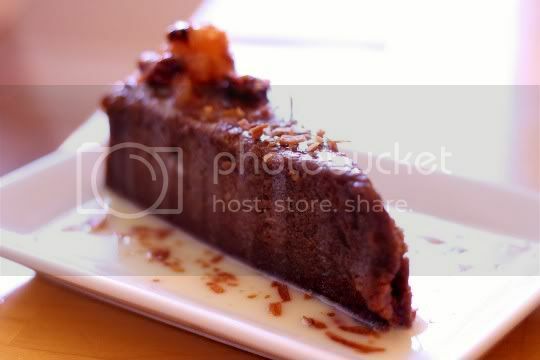 Served warm, the cake is dense, moist, and not overly sweet. But oh boy, when you get to the center of that thing, watch out! The rum packs such a punch that you think you've just taken a shot of it! The milky coconut sauce that the cake sits in is where a lot of the sweetness comes in, but I can't leave out the candied coconut shreds, sugary glaze, and juicy guava pieces on top. Looks like I may need to give this rum cake thing another try! 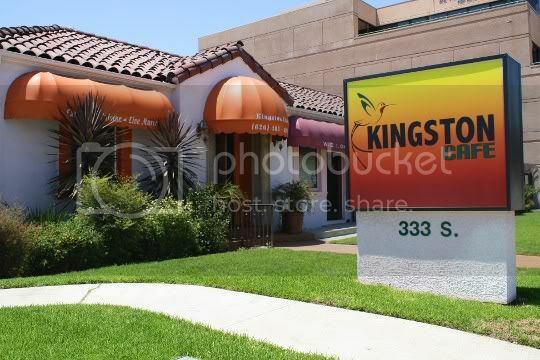 I'm not Jamaican, nor do I have any Jamaican relatives, but I definitely was impressed with the food at Kingston Cafe. This is how the Caribbean should taste! Steaming hot, packed with overwhelming flavor, and served with love. And of course, the sincerely warm and kind staff just adds extra points. I kid you not, I couldn't stop thinking about what an incredible food and service experience I had here for at least a week! UPDATE: It's been brought to my attention that this restaurant was featured on Gordon Ramsay's TV show, "Kitchen Nightmares." I have yet to see it, but I guess whatever Ramsay changed is really working! Wasn't that place made over by Gordon Ramsey on TV? Yes, thanks for that info! I had no idea when I actually went. I guess whatever they did is working!